I ordered your Shoulder ebook on treating and preventing shoulder injury. I am rehabilitating a shoulder impingement that doesn't limit range of motion, but does cause pain when doing bench press and dumbbbell flies, which I'm not doing for now. 1) How often should I perform the exercises? It looks like the exercises in 5-c are recommended 4-5 times per week. Does that apply to all of the exercises? What frequency should I perform them? 2) Some of the exercises require a doctor's/therapist's table for full range of motion. Will I benefit from these exercises if performed on a bed that doesn't offer a full "reach" to the floor, or should I not do them without a full reach? 3) I've never done Pilates before. 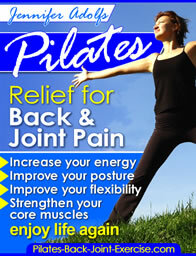 Your website mentions Pilates-based control, breathing, etc. Do I need Pilates "training" to do these properly, or were you just referring to using proper form, exhaling on contraction, etc. Also, how much resistance should I use in terms of bands - enough to generate soreness, or just enough to stretch things? I've never used bands; my experience has been with free weights & machines. Sorry for so many questions - just want to make sure I'm getting the maximum benefit from these exercises to strengthen my shoulder (and avoid surgery, of course!). 1) You can perform the stretches daily, stabilizing exercises and strength exercises every other day. 2) Yes, the strength exercises can be performed on a bed or solid surface and work for a larger range of motion as you gain more strength and flexibility. You should be able to develop a long reach without locking at the elbow so you control the weight more from your upper back (shoulder blades) than from the arms and shoulders. 3) The Pilates breath is always an inhale as you extend the spine or a body part away from the core and an exhale as you flex, bending the spine or bringing a body part back to the center. When using weights you are exhaling on the work or exertion. 4) Use the bands to develop longer, lengthened muscles, a medium weight (green band), and only when you develop more strength and range of motion, then increase the strength of the band (blue or a darker color is generally stronger resistance). Bands will fatigue your muscles after more repetitions, which will develop more muscle endurance than regular weights. The nice thing is that the stretch bands and Pilates springs develop longer and stronger muscles with better flexibility so you will have less injuries from muscle and tendon strains. Check out my Shoulder Ebook here for more tips on treating and preventing shoulder injuries.